Right now, though, it is quite young. 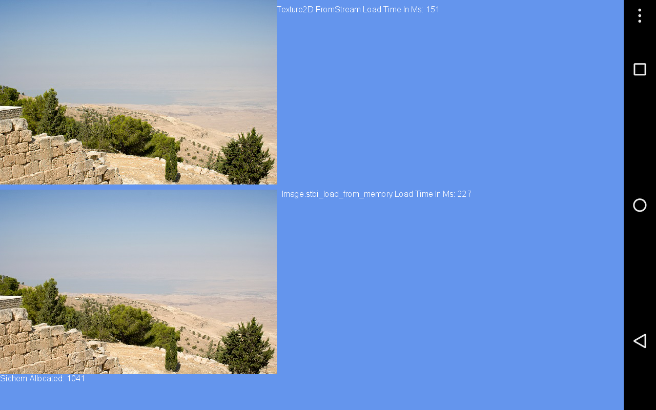 Only stb_image.h is ported and not completely; it can load only .png and .jpg files. It requires VS2013 & MonoGame 3.5 to be opened/compiled. As you can see the StbSharp is somewhat slower. But on the other hand it gives consistent result of the run-time image loading through different platforms. Sichem is C to C# code converter. It uses libclang to build the syntax tree from C and generates the C# code from it. Right now, Sichem works only with stb_image.h. However if required it could be tuned to port other C projects. Now, let's return to StbSharp. My first priority is to add other images types supported by stb_image.h (gif, pic, psd, etc). Then I'll consider taking another stb library (i.e. stb_truetype.h). Interesting to see. Looking at the code, you may be able to get a small improvement at Image.cs(303) by using fixed on the data array as it will be doing bounds checking on every access. You may also get a benefit from Marshal.Copy from an IntPtr to managed array. You may be interested to see there is already a port of stb_truetype in the form of TrueTypeSharp. The above link is in Russian, however the device characteristics are understandable. So the loading time is 151 ms for Texture2D.FromStream and 227 for StbSharp. Overally StbSharp is about 1.6 times slower than Texture2D.FromStream. And there was same proportion on WindowsDX. Great there is TrueTypeSharp already. Probably I'll port something else then. I would like to post update on this project. As there was significant progress during the last year. As there was some confusion, I would like to clarify, that StbSharp is port. It's not wrapper. I took original C code and converted it to C#. So StbSharp doesnt require any native binaries. I've made a small MG sample(requires MG to be installed). It demonstrates StbSharp in action: it draws image loaded with StbImage, plays music loaded with StbVorbis and draws text from font loaded with StbTrueType. Do you thing that we could port IMGUI in full C# with Sichem ? Sichem ports code from C to C#, while IMGUI is C++. Meanwhile StbSharp 0.7.1 is out. 1. Draws an image loaded with stb_image. 2. 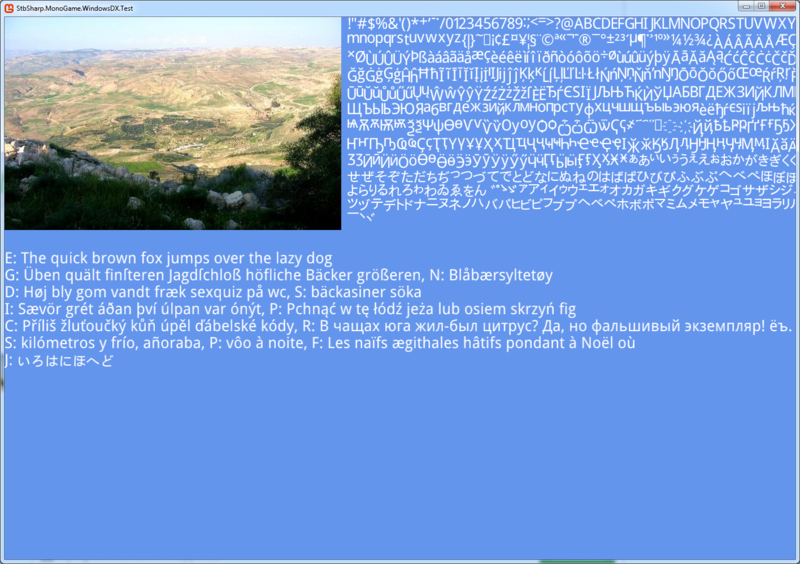 Dynamically creates SpriteFont from two different ttfs using stb_truetype and draws text. 3. Streams audio to DynamicSoundEffect from an ogg file using stb_vorbis.